Impediments by federal regulations, third party payer oversight and hospital hierchy looking over the shoulders of doctors and other health care professionals are turning what was once their passion into a job. Many are retiring early, looking elsewhere, or avoiding the health care field altogether. 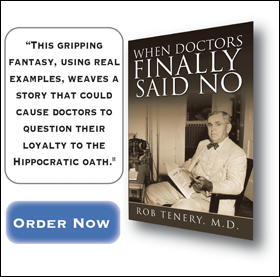 The genesis of my latest book, When Doctors Finally Said No, started over two decades ago, as I watched the transformation of this treasured profession being pushed and dragged into the state it is today. The best way to reassess the role of the ‘doctor’ is to go back to when taking care of and caring for patients started. For only then can we know the obligations of those who are entrusted with the health and wellbeing of the sick and injured. The physicians’ oath ‘Do no harm’ is attributed to the ancient Greek physician, Hippocrates, but it isn’t a part of the Hippocratic Oath. It is actually from another of his works, Of the Epidemics. Hippocrates’ Of the Epidemics says: The physician must be able to tell the antecedents, know the present, and foretell the future — have two special objects in view with regard to disease, namely, to do good or to do no harm. In this work, Hippocrates acts as a prognosticator, raising concerns about not just one malady and one patient, but encompassing the past, present and future of many patients and the maladies they might face. Although fiction, these true, medically related stories weave together a movement that is building barriers between doctors and their patients by using criteria based on outcomes instead of efforts. The oath, once the bedrock of this still unpredictable science, has now become its Achilles heel. Many of those in the federal government, the insurers, the hospital corporations and the bottom-feeders from the legal community feel they can legislate, regulate, administrate and litigate without real concern what harm might come from their actions, because doctors pledged to do no harm. Hippocrates’ pronouncements laid out an additional duty for doctors beside do no harm and that is doing nothing.